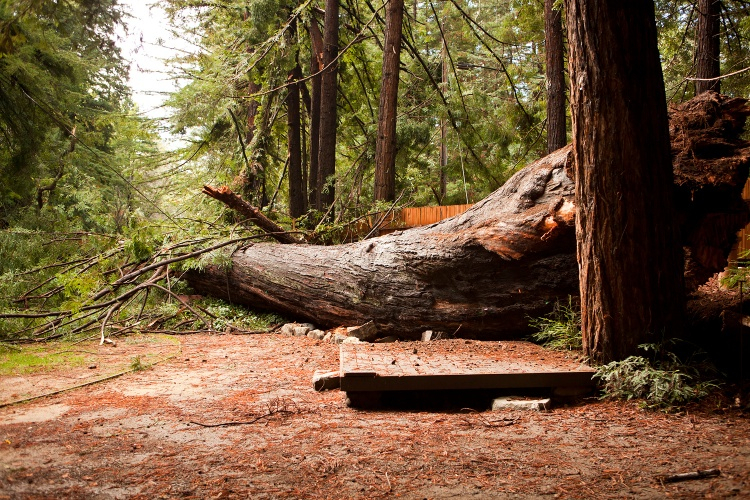 The second Big Sur Redwood Auction is coming up – Sunday, October 4th. But what about the tree? The second Big Sur Redwood Auction is coming up – Sunday, October 4th at 4 pm at the Henry Miller Library. RSVP HERE. But what about the tree that fell? How old was it? How tall? Years before Europeans first stepped foot in California…. A century before Galileo claimed that the earth revolved around the sun…. 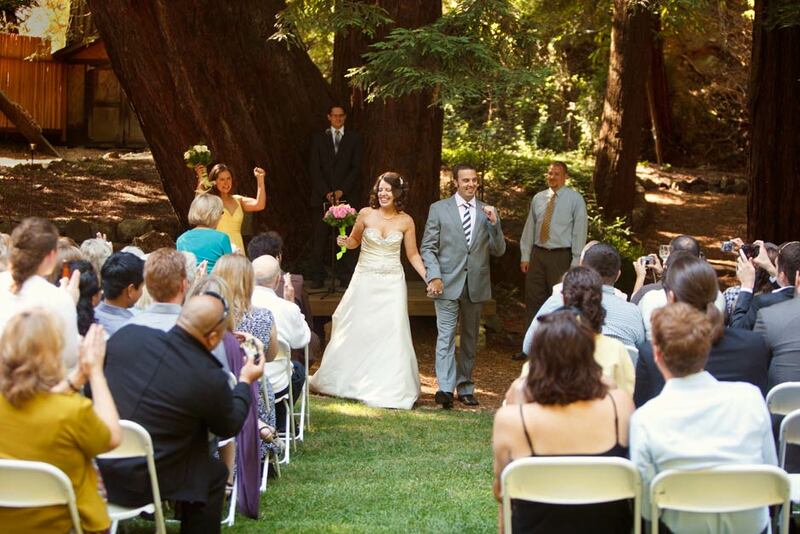 …a 200 foot old-growth coast redwood tree stood in what is now Big Sur, California, approximately 36.2703° N, 121.8064° W.
The Tree, circa 2010, directly behind the bride. And there it stood for close to 500 years. From 1983 onwards it hovered mere feet from the non-profit art space, Henry Miller Memorial Library, and in the subsequent 30 years it bore witness to countless weddings, outdoor performances, movie screenings, and so much more. At 9 am, staff member Mike Scutari was eating breakfast in the back office when he heard that terrifying, unmistakable sound. He ran out and instantly saw an explosion of what looked like sawdust near the base of the tree, as if a stick of dynamite was detonated in its trunk. See him tell his tale HERE! Slowly, glacially, but not without a fight, defiantly taking down a power pole, telephone lines and other trees with it. The tree was no more. The Tree, December 2, 2012, about four hours after the fall. Upon examining the wood, local lumberjacks and millers were amazed at what they found: pure, pristine, unadulterated redwood, ideal for artistic or household uses like tables, benches, counters, doors, and paneling. According to the National Park Service, “96 percent of the original old-growth coast redwoods have been logged.” So when a tree of this stature falls, and when it’s discovered to be comprised of pure, beautiful redwood, it is nothing short of a miracle. Working with local lumberjacks and millers, the Henry Miller Memorial Library is now selling 10 completely seasoned slabs. See under ‘buy’ above. On October 4 we are putting ten of the finest pieces up for auction. Click HERE to bid on a slab in advance. ← “Henry Miller: Excerpts on a Traumatized Existence,” courtesy of Solidarity Hall!